From a rosette of yellow-green sticky leaves that lie flat on the ground like a fallen star, Butterwort plants produce two or three hairy upright flower stalks each bearing a single purple flower. The leaves of Butterwort are sticky, and when an insect alights on a leaf it becomes trapped on the sticky surface glands. The insect’s struggle to escape stimulates the leaf to curl around the hapless victim and release enzymes that digest it. When only the dry shuck remains, the leaf uncurls ready for the next meal. In this way, Butterwort is able to thrive on very poor acidic soil. This carnivorous plant grows in bogs and seasonal damp flushes, including dune slacks that are submerged in water during the winter. 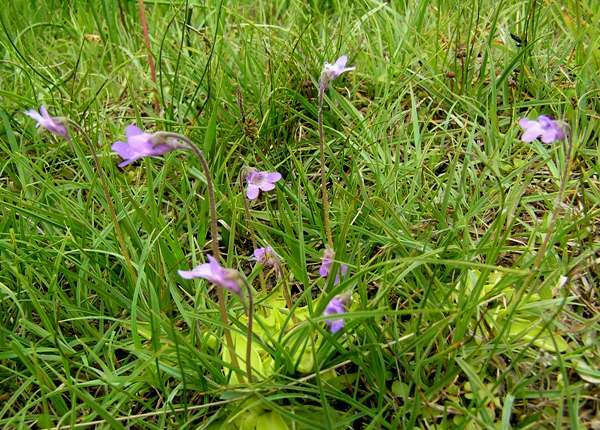 Butterwort Pinguicula vulgaris is widespread in the north and west of Britain and Ireland; it is also a common sight throughout northern and central European countries, including Slovenia where it is also possible to see the closely related Alpine Butterwort, Pinguicula alpina. 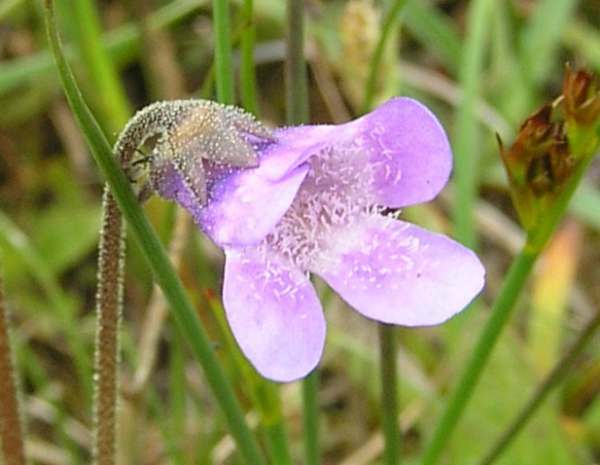 Butterwort blooms from May to August, depending on altitude and the site exposure to cold winds. The pictures on this page were taken at Tregaron Bog National Nature Reserve in West Wales.